This house in Norwood Park could be a Mount Vernon model from Montgomery Ward or a Cabot model from the Gordon-Van Tine Company. They are the same house, manufactured by Gordon-Van Tine, but sold under different brands. The front door is bracketed by sidelights (the originals were much prettier) and is covered by a pediment supported by twin Doric columns. The Mount Vernon/Cabot normally had symmetrical front windows, but in this house, an extra window was added to the living room. I have seen this modification on other Mount Vernons/Cabots. Another difference is that the roof of this house has unclipped gables. Again, I have seen this modification on other Mount Vernons/Cabots. The Mount Vernon/Cabot is a very pretty Colonial bungalow. I wish the owners could get rid of the wrought iron railings and the orange color and fix up the exterior. The concrete porch probably ran the full length of the front of the house originally. 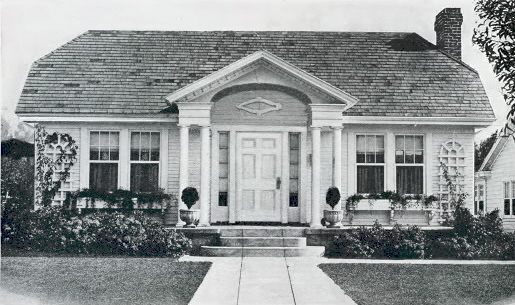 The house was built in 1927. The original owners were William H. Schnell, his wife, Bertha, and their three kids. William was a structural steel draftsman. Sometime before 1935, the Schnells moved to Des Plaines. Wilbur H. Webb and his family moved in. Wilbur was a steel salesman--I'd bet he and William were business associates. The Webbs reported on the census that they paid about $7000 for the house. They lived in the house until at least 1945.